East Georgia State College's Military Student Resource Center is dedicated to providing active duty, reserve service members, veterans and dependents of service members with convenient high quality services. The center also features a lounge for students to relax and study. 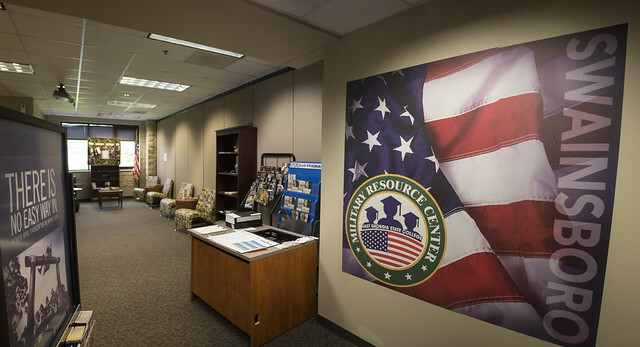 The resource center offers advising, including partnering students, faculty and staff with military students as their mentors. In order to be certified by East Georgia State College, students must submit a copy of their Certificate of Eligibility (or NOBE) to the VA Certifying Official, Georgia T. Mathews. The COE is issued by the Veteran’s Administration office once an online application (VONAPP) has been completed and submitted to the VA. Students are certified by the institution at the beginning of every semester, immediately following Schedule Adjustment. Any changes to your degree, transfer pathway or enrollment (drop/add/withdrawals) must be reported to the VA Certifying Official, Georgia T. Mathews. If you have not completed a VONAPP with the Veteran’s Administration office, applying for your VA education benefits here. Once you have completed your VONAPP and submitted it to the VA office, please print a copy to submit to Enrollment Services at East Georgia State College. Complete the required information for a base role GoArmyEd account, which results in the creation of your GoArmyEd user name and password. The base role access will allow you access to training, helpdesk, on-duty classes, and testing. After you complete the steps listed above, your Army Education Counselor/ESO will review your application and, pending approval, activate your GoArmyEd account. You will receive an email when your application has been approved and you have access to request TA. TA Requests MUST be submitted before the class starts or no later than the final day of the school’s late registration period. The TA Request displays. Complete each required field in the Class Information sections. Note: Valid cost verification WILL include one or more of the following: an itemized receipt or screenshot from an online account with the school, a current invoice from the school, or a statement of tuition and fees specific to your enrollment or account with the school. Tuition and fees must be listed separately. The course start date and number of credit hours is also required for each request. Complete each required field in the Class Cost section and select “Calculate Cost” so you can see the final Army and Soldier costs. When the TA Request is approved by the Army, you will receive a confirmation email. You must print and submit a copy of the approved TA Request to your school when registering for classes. Note: If TA does not cover the entire cost of the class, you are responsible for the remainder, which will be billed directly by the school. Military Personnel Application. Military personnel, their spouses, and their dependent children stationed in or assigned to Georgia and on active duty. The waiver can be retained by the military personnel, their spouses, and their dependent children if (a) the military sponsor is reassigned outside of Georgia and the student(s) remain(s) continuously enrolled and the military sponsor remains on active duty military status; (b) the military sponsor is reassigned out-of-state and the spouse and dependent children remain in Georgia and the sponsor remains on active military duty; or (c) active military personnel and their spouse and dependent children who are stationed in a state contiguous to the Georgia border and who live in Georgia (BoR Minutes, February 2009) are eligible to receive a military waiver of non-resident fees. Georgia National Guard and U.S. Military Reservists Application. Active members of the Georgia National Guard, stationed or assigned to Georgia or active members of a unit of the U.S. Military Reserves based in Georgia, and their spouses and their dependent children (BoR Minutes, October 2008). Recently Separated Military Service Personnel Application. Members of a uniformed military service of the United States who, within thirty-six (36) months of separation from such service, enroll in an academic program and demonstrate an intent to become a permanent resident of Georgia. This waiver may also be granted to their spouses and dependent children. For additional information concerning residency, students should contact the Office of the Registrar in the Jean Anderson Morgan Student Activities Center or write to the Office of the Registrar, Attention: Lynette Saulsberry, East Georgia State College, 131 College Circle, Swainsboro, GA, or e-mail lsaulsberry@ega.edu. The Office of the Registrar must receive student’s out-of-state tuition waiver application deadline before the deadline listed on the application. East Georgia State College will continue to consider and evaluate out-of-state waivers 45 days from the first day of the semester for the purpose of awarding; however students area still obligated to pay their tuition and fees by the Final Fee Payment Deadline for the semester. Students who wish to have their military experience and training evaluated for college credit should submit a copy of appropriate forms to the Office of Admissions. See the current college catalog (bottom page 17) for more information. DISCLAIMER: The external resources listed on this page are not affiliated with East Georgia State College and do not constitute endorsement by EGSC of the external resource being offered or any organizations mentioned. External resources listed are for informational purposes only. All the following links will open in a new tab/window.